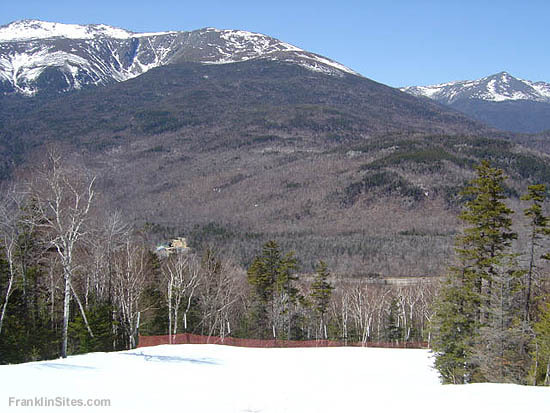 Located on the eastern side of Pinkham Notch, Wildcat Mountain is overshadowed by the adajcent Presidential Range. The peaks known as "Wildcat D" and "Wildcat E" have been home to alpine ski trails since the 1930s, including a legendary CCC ski trail. The Wildcat Ski Trail was cut from Wildcat E in 1933, with a cabin being constructed near the summit in 1934. The cabin would later be removed as a much larger building was constructed to house the top terminal of the gondola lift in the Wildcat D - Wildcat E col in 1957. The Wildcat Ski Trail was surveyed by Charley Proctor and cut in the summer of 1933 by the CCC, opening that winter. A Class A trail, the Wildcat was up to 60 feet wide and ran for 1.5 miles over the course of 2,000 vertical feet. In 1955, Mack Beal, Brooks Dodge, George Macomber, and Malcolm McLane started development of a lift served ski area on Wildcat Mountain. The ski area opened in the winter of 1957-1958 with a top to bottom gondola, incorporating the Wildcat Ski Trail into the trail network. The trail is still skiable today, albeit in modern fashion with snowmaking. 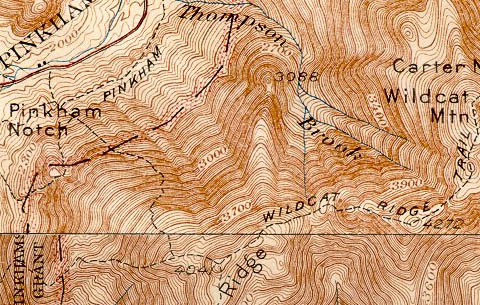 The Hopper Trail was displayed on maps in the 1930s and 1940s and ascended from the Lost Pond Trail in Pinkham Notch, possibly up to Square Ledge, and then down to the Wildcat Ski Trail. It is not known if this trail was cut by the CCC, or if the current Square Ledge Trail follows part of it. The trail was abandoned after the Hurricane of 1938.
" Wildcat Summit "E" Ski Trail. 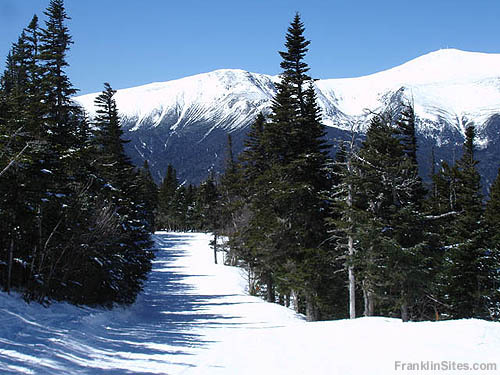 This trail (for expert skiers) starts from Pinkham Notch Road opposite the site of Darby Field Cottage and about 1/2 m. N. of Pinkham Notch Camp. It ascends E. nearly to Summit E. of Wildcat Mt., rising 2,000 ft. 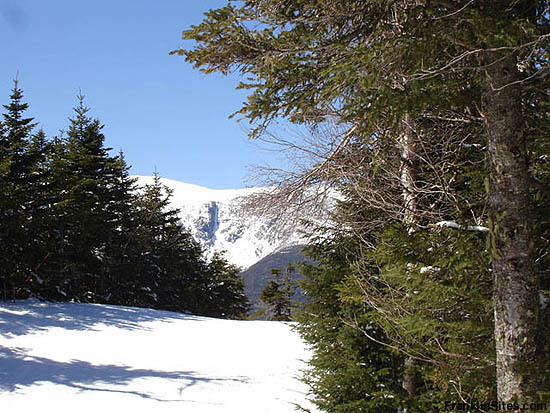 It crosses the Pinkham Notch Ski Trail 1/8 m. from the road; at 0.3 m. it bears E., while the Hopper Ski trail continues S. It requires at least 15 inches of packed snow, is 1.5 m. long and 15 to 50 ft. wide. " " Hopper Ski Trail. This trail is 12 to 30 ft. wide, and extends E. and N. from a point on the Lost Pond Trail 1/8 m. from Pinkham Notch Road to a point on the Wildcat Summit "E" Ski Trail 0.3 m. from the same road. It requires 12 to 15 inches of snow, is 1.2 m. long, rises about 800 ft. and can be covered in either direction in about 1 hr. It is suitable for the intermediate skier going from S. to N. and for the expert in the opposite direction. 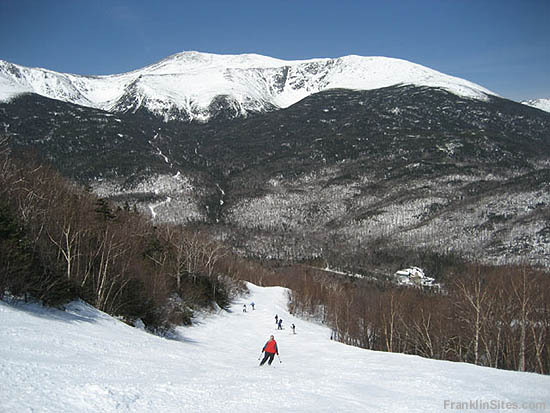 By using this trail a round trip, S. to N., from Pinkham Notch Camp via the Wildcat Summit "E" Ski Trail and the Pinkham Notch Ski Trail can be made in about 1 1/2 hrs. " 1. Location - Opp. A.M.C. Camp on H. 16. 2. Length - .7 mi. 4. Max. Grade - 26º. 6. Exposure - S.E. Rough ground, 24" snow. 7. Short, steep trail for advanced skiers. 4. Max. Grade - 14º. 6. Exposure - N.W. 15" snow. 7. Moderate trail for novice and intermediate skiers. " 1. Location - Running E. from H. 16 about .25 mi. N of A.M.C. 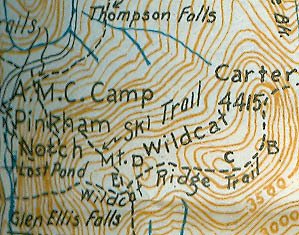 Camp to summit "E" of Wildcat Mt. and public cabin (equipped only with stove and bunks). 4. Max. Grade - 33º. 6. Exposure - N. 20" snow. 7. Fast, difficult trail with good variety of grades and turns. " " Wildcat Trail (W.M.N.F.). Running E. from State 16 about 0.25 m. N. of A.M.C. 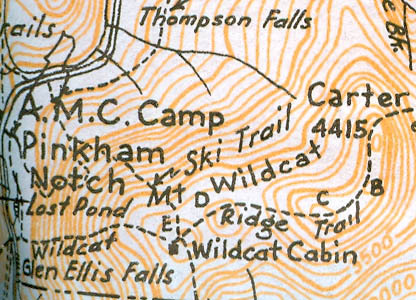 Camp to summit 'E' of Wildcat Mt. and public cabin (equipped only with stove and bunks). Length 1.5 m. Max grade 33º. Fast difficult trail, with good variety of grades and turns. " " Before the hurricane, it was decided to abandon some of the ski trails which had little use. The following trails in the White Mountain National Forest will no longer be maintained by the Forest Service.
" Wildcat Summit "E" Ski Trail. This trail starts from Pinkham Notch Road opposite the site of Darby Field Cottage and about .5 m. N. of Pinkham Notch Camp. It ascends E. nearly to Summit E. of Wildcat Mtn., rising 1,900 ft. 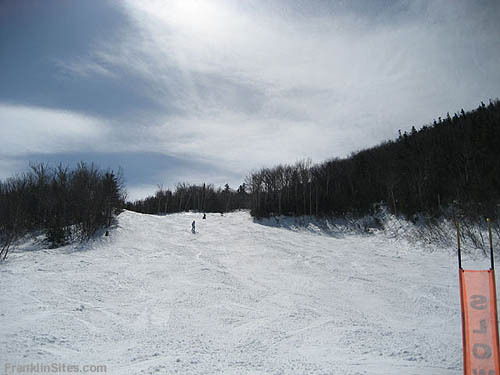 It crosses the Pinkham Notch Ski Trail .1 m. from the road, is 1.5 m. long, and has an average slope of 15 degrees. There is a cabin in a sheltered depression just beyond the upper end of the trail on the S side of the ridge. " " Wildcat Summit "E" Ski Trail. This trail starts from NH 16 opposite the site of Darby Field Cottage about 0.5 m. N. of Pinkham Notch Camp. It ascends E. nearly to Summit "E" of Wildcat Mtn., rising about 1,900 ft., is 1.5 m. long, and has an average slope of 15 degrees. There is a cabin in a sheltered depression just beyond the upper end of the trail on the S side of the ridge. " 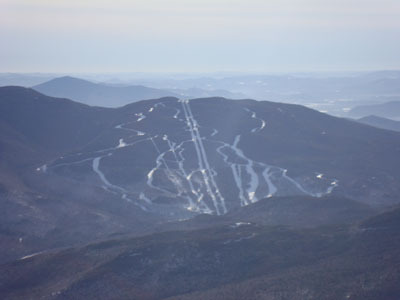 " 1958: Wildcat Ski Area opens in January with the first gondola lift in the country. " Graham, C.L. 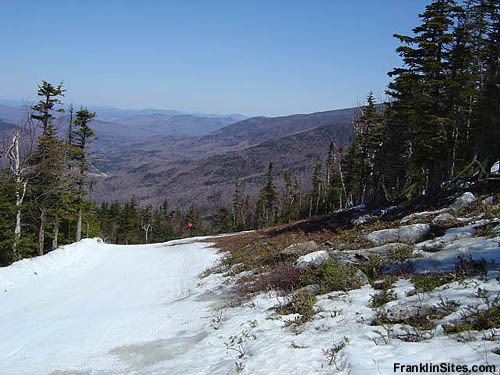 "Some Ski Trails to be Abandoned in the White Mountain national Forest." Appalachia. December 1938. Leich, Jeff. "The Wildcat Trail." 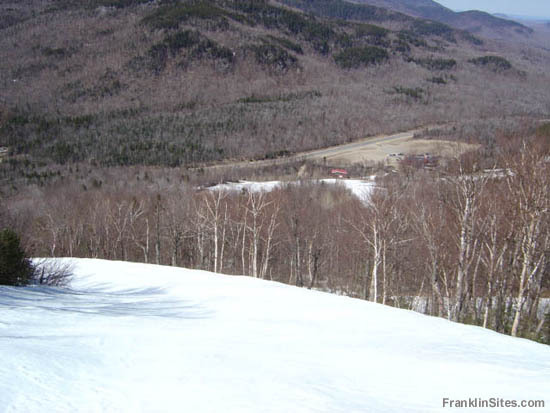 New England Ski Museum Online Journal. January 21, 2006. http://www.skimuseum.org/page.php?cid=doc23.